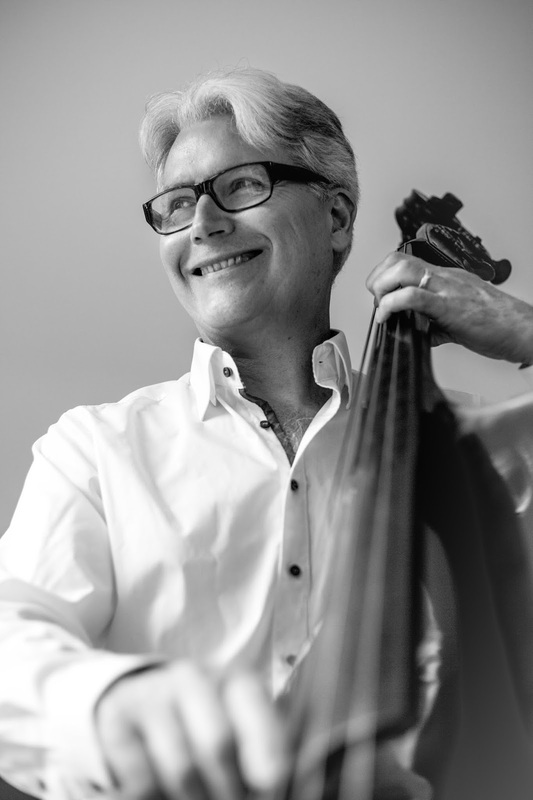 John Goldsby is many things: bass player, jazz writer, educator, and teacher. He has written a definitive book on jazz bass, The Jazz Bass Book: Technique and Tradition. His career has spanned many decades and two continents. He spoke to Sebastian Maniura for LondonJazz News. As I chatted to John Goldsby recently I realised that his career and the way that he thinks about music are inextricably linked; fusing the stories and playing techniques of the jazz bass greats past and present to create new sounds and ideas. As a teenager, John was a guitarist in a rock band playing songs by Led Zeppelin, Cream and Hendrix. He started playing bass when the band needed a bassist. In high school he began playing with older fusion musicians and listening to the electric fusion albums of Miles Davis such as live-evil, thinking “this guy Miles Davis plays this really cool electric fusion jazz rock music, then I started going back and listening to other Miles Davis records”. In his last year of high school John picked up a double bass, quickly getting to grips with the instrument. With the help of Daniel Spurlock, principal of Louisville Symphony Orchestra, and Jamie Aebersold, he became a promising bass player in the local jazz scene. John talks a lot about the importance of mentorship and imitation in the early stages of any jazz musicians’ career because the ways in which he developed his own style are based strongly on personal experience and imitation. He also promotes the idea that no matter what style or era a piece of music or recording is from, there are common threads that connect all music, especially jazz. In 1980, he moved to New York. At that time there weren’t many jazz courses in colleges so he learnt from older players and started to get gigs because he played strong time, had a good grounding in classical technique and was stylistically versatile after imitating records. “As a bass player in New York if you knew a lot of tunes and had a decent quarter note beat people wanted to play with you. I felt pretty lucky.” But, as he also recalls, “it’s very easy to be pigeonholed as one type of player in New York” and he got labelled as an acoustic, trad player. He was able to slightly subvert that, playing swing one night and modern compositions another. He could see the similarities and differences between styles and was able to pick out the best of the best. It is still possible to make it in New York without going to a conservatoire, but, once again he emphasised the importance of a “scene” – “you need players to jam with, mentors and older players to learn from and you need to be prepared and open to play in as many rehearsal bands and jam sessions as possible.” So much depends on the individual's talent, energy and commitment. John recalls conversations with the singer Kurt Elling, where they both wondered what happened to players they knew, realising that “either they got married and moved off somewhere strange or they got into drugs or there was some problem, there are a lot of ways not to make it”. Kurt Elling actually said there are “1000 ways to fail!” Jazz schools and qualifications sadly don’t change that harsh fact. In 1991, Goldsby was touring Europe with Louis Bellson and met the manager of the WDR Big Band who mentioned that the band’s bass chair had opened up. John, in his “typical New York fashion”, offered to take the job without realising the role had a long audition process. He ended up having a trial on both bass guitar and double bass, and he got offered the job in 1994. At that point he had been playing successfully in New York for nearly 15 years, however he had a young family and, “in New York you work more but seem to get paid the same”, so he took the job in Germany. The job itself is very similar to an orchestral gig, it’s full time, 12 months a year, with a salary. There are daily rehearsals and concerts at the end of the rehearsal period. After the intense nature of the New York scene it was “quite quiet”, leaving time for writing and pursuing other musical avenues. Even after 24 years, John still enjoys it immensely, partly because the diversity of the projects means that he can fully utilise his knowledge of multiple different aspects of bass playing. This stylistic diversity can be heard on the WDR Big Band’s two most recent albums, Channels of Energy by Antonio Sanchez (released on 23 March) and An Argentinian in New York by Pedro Giraudo (released on 6 April). There will also be a chance to hear Goldsby with the WDR live at the London Jazz Festival on 25 November in a concert featuring pianist and composer Bill Laurance. This summer John will also be returning to the Sligo Jazz Summer School as a teacher and it’s this aspect of his work along with his writing that we will be featuring in Part Two.